Astrobiology today covers many disciplines, among them being the search for microbial life on planets in our own solar system, such as Mars. Following the discovery of features created by water on Mars, we should be using these features as a starting point to look closer for microbial life. One of the ways in which microbial life can leave an imprint on sandy rocks like those on Mars, is through the formation and preservation of microbial mats and their associated structures. 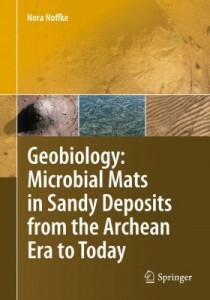 In this book, Nora Noffke deals systematically with these microbially-induced sedimentary structures on Earth, both in the modern environment, and in fossil deposits of all ages. The text, methodical throughout, begins by introducing the concepts of microbial life, their biofilm and mat-forming habitats, and the preservation of these mats within the fossil record. The importance and necessity of the study, the product of nearly a decade of work, is put into an ecological and palaeontological context from the outset. The concepts of microbial mat formation and preservation are then described step-by-step, assuming no prior knowledge beyond rudimentary biology. Using plain English with very little jargon, the author conveys her dedication, and the informal tone of the text makes many tricky concepts easy to follow. Critical sections for any palaeobiologist or astrobiologist are introduced early-on, including a method for search and detection of Microbially Induced Sedimentary Structures (termed MISS by the author), and a practicable list of criteria for establishing biogenicity of these structures. Following the comprehensive introduction of concepts, the majority of the text is given over to a classification of the 17 types of MISS identified by the author. This classification system hinges around a central figure whose end members are represented by the major physiological processes of mat living microbes. It is a clear and logical scheme, and one that is bound to stand the test of time. Each of the 17 confirmed types of MISS are illustrated with colour photographs, and extensively described from both modern and fossil settings, including insightful discussion into environmental significance. The final section of the book introduces various applications of the readers’ newly acquired knowledge of MISS. Potential field trip sites are described fully, for study of both modern and ancient microbial mats. Sadly no Martian field trip site is yet included! Extensively referenced and laid out in a logical and methodical manner, the reader is provided with all the information they need to understand the concepts, and this is communicated in a clear and friendly way. The only criticism lies with the images used to illustrate points within the text. Where photographs are included, they are often too small to be able to discern well the low relief delicate structures that the MISS represent. Schematic, idealised cartoons are used effectively, but more of these could be used to enhance the readers’ understanding. This volume is fascinating and hugely informative, and in writing it Nora Noffke has managed to appeal to a wide readership. To an interested layperson, with no prior knowledge of microbiology, palaeontology or sedimentology, the book contains all they need to know to gain a thorough understanding. To a more advanced worker, in Precambrian palaeontology or astrobiology for example, the comprehensive treatment of all types of microbial mat structures can provide them with specific details sure to be relevant to their own field.